- Small Surface - Big in benefits, this compact converter turns your current tabletop into a height-adjustable standing desk. - Medium Surface - With a slimmer width, WorkFit-T converts a corner worksurface or other tight spaces into a sit-stand desk. 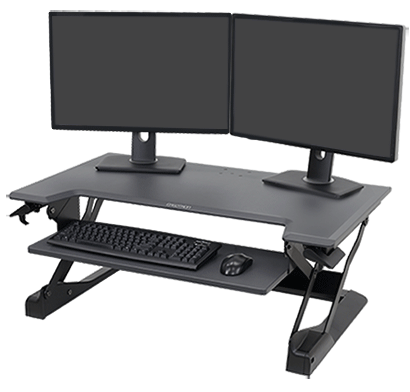 - Large Surface - Presenting an easy standing desk solution, which transforms any tabletop into a full sit-stand workstation. WorkFit™ brings new flexibility to the old-style office: increasing options for where you position equipment, improving workflow, boosting social interaction, and (best of all) helping you feel better. Find the Standing Desk that’s right for you. Sit less. Stand more. Start now. The freedom to move around your workspace improves mind, body and soul. See the benefits of standing while working. Sit. Stand. Crank your productivity to 11. 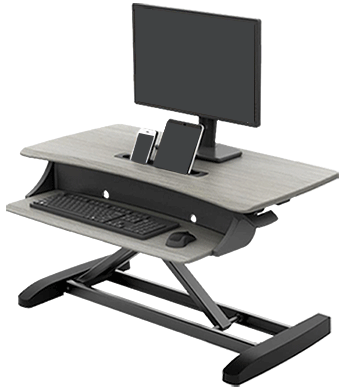 With a WorkFit Sit-Stand Desk Workstation, you can work the way that works for you. Carpe Diem. Calorie Burn ’em. Standing while at your desk promotes fitness. See the difference in calories burned. Compendium of Physical Activities | Ainsworth BE et al. Looking for 3 or more products? We can fit your budget and help turn your office up! Just fill out this form and we'll get back to you soon. Our high-quality products are backed by specially trained support professionals. Tested, safe and certified, our warranty policy ensures dependable performance and peace of mind. Our products undergo a testing regimen that exceeds the most rigid quality expectations. Ergotron’s passion for innovation is evidenced in our large and growing number of patents. Introducing the health benefits of up and down. 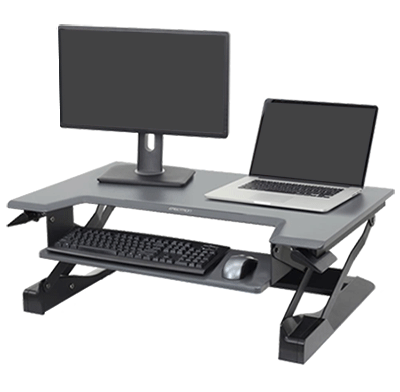 For work or play, inputting parts data or scanning chocolate chip cookie recipes, WorkFit Sit-Stand Workstations and associated products are the easiest way to sit less, stand more and put your well-being first. Standing can reduce your risk of heart disease while also increasing good HDL cholesterol levels. Standing strengthens leg, ankle and foot muscles while also increasing balance. To stay alert and for a natural jolt of energy, standing can be a simple but overlooked remedy. Standing discourages mindless snacking and increases the enzymes needed to metabolize food. The spine is in a more naturally aligned position while you stand as opposed to being hunched over a desk. When you are standing, fat burning enzymes stay activated, burning far more calories than when you are sitting.